More and more companies are using Twitter to interact with customers and build an online community every day. As with any new social media site, there are a number of challenges that arise. To begin, the goal is to build a community of relevant followers and start interacting with them in a meaningful way. Once this first goal is accomplished, the challenge then becomes managing a high volume of tweets, Direct Messages, and @ replies. We have compiled a list of several tools and directories that can help both new and experienced tweeters build and then manage a brand’s Twitter profile. Social Too: Enter your Twitter username and password to automatically follow everyone who is following you on Twitter. Following other users lets you avoid being seen as a “broadcaster” rather than a part of the community. Mutual following also allows users to exchange direct messages. Twibs: Twibs is a directory of all companies on Twitter. Twibs.com is a great tool for researching competitors and brands to understand how they use Twitter. Mr. Tweet: Follow @Mr. Tweet (http://twitter.com/MrTweet) to receive recommendations on users to follow based on your current network and popularity on Twitter. Twitturly.com: A directory of the top URL’s that people are talking about on Twitter. Use it to find out what kinds of content are popular. Retweetist.com: A directory of top retweeted items on Twitter. 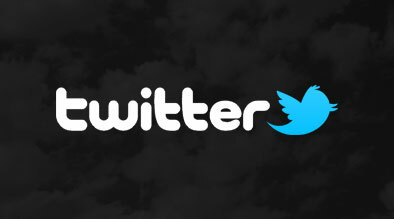 This directory can be used to find out the popularity of what you are tweeting about or what others are tweeting. Justtweetit.com: A directory of twitter users, organized by profession and interest. This directory can be used to find people who are relevant for you and your business. 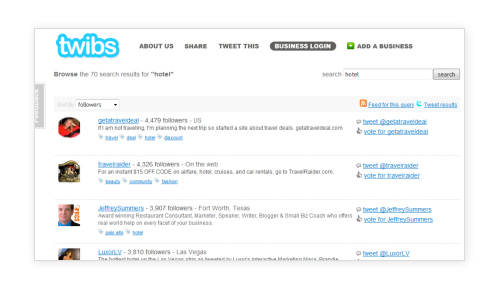 Wefollow.com: Directory of twitter users, organized by popularity and by keyword tag. MediaOnTwitter (www.trackvia.com): Directory of media outlets and reporters on Twitter. 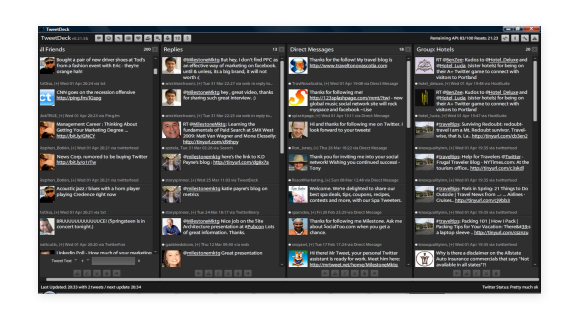 Tweetdeck (http://www.tweetdeck.com): Tweetdeck is a great application for organizing your Twitter account. You can easily follow users, send retweets, @ replies and direct messages, and organize the users you are following into groups. 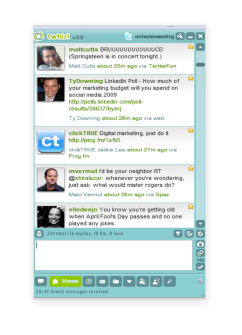 Twhirl: (http://www.twhirl.com): Twhirl is a similar application to Tweetdeck, without quite as much organizational utility. One plus of twhirl is that it allows you to manage multiple twitter accounts as well as multiple laconi.ca, Friendfeed and seesmic accounts. Cotweet (https://cotweet.com): A web based tool that allows brands to have multiple users sharing one twitter profile and easily manage replies and tweets in real time. Cotweet is still in private beta testing, but seems very powerful. It is built for a scenario where a company uses twitter and multiple people manage it. Twitterhawk (http://www.twitterhawk.com/): TwitterHawk searches for keywords in messages and automatically generates tweets in response to those messages. Each automatic tweet costs $0.05. Twitter Feed: (http://twitterfeed.com/): Twitterfeed is a tool for automatically posting your RSS feed to your Twitter account. Each new blog post appears as a new tweet with a link to the full blog post on your blog. 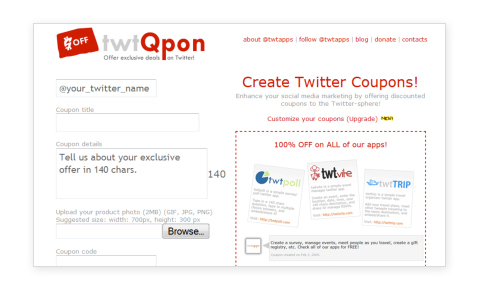 TwtQpon: (http://twtqpon.com/): Create and share coupons in Twitter. This is a great application as more and more people are searching for deals and discounts. 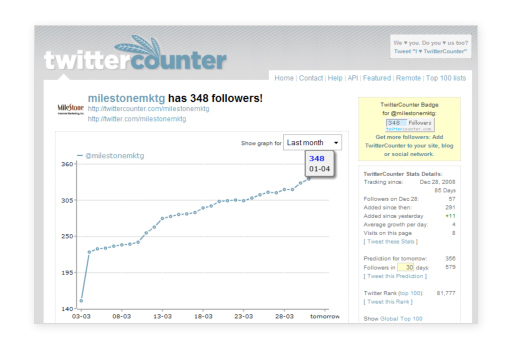 Twitter Count: A tool that tracks the number of followers for each Twitter account. This tool shows the average growth of followers per day in addition to other trends, and allows you to compare your account with your competitors. Twitalyzer (http://www.twitalyzer.com/twitalyzer/index.asp): A tool to help measure the influence of a user on Twitter. Influence is measured in relation to other users, volume of tweets, interaction and number of followers. Any or all of these tools can be helpful while managing your Twitter account, but the most important thing you can do is to make sure that you create meaningful interactions with your community of followers. I tried Twhirl and tweetdeck.. both are equally good. should be trying the others listed. thanks for the list. Thanks for the comment. Since social media is such a rapidly evolving ecosystem, the number of tools available is always changing too. If you come across any that you love, let us know!